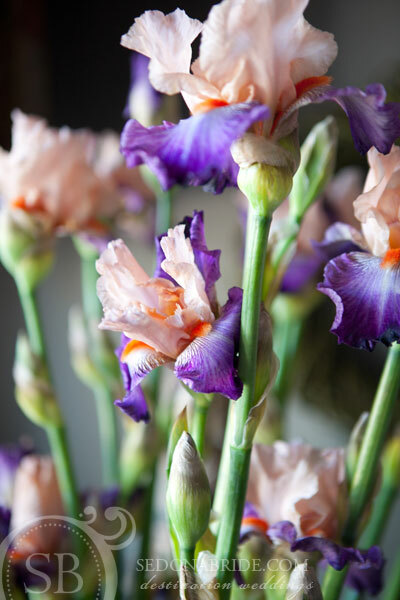 We absolutely LOVE Bearded Iris. The colors are exciting and the faint fragrance says”spring” like no other flower. Iris are exotic but remain fragile and delicate. They are such a performance flower. Upon arrival, Iris have tight buds that are just starting to show color and then quickly open. The bloom lasts about two days, then withers as the next bloom below begins to open. Bearded Iris are available commercially beginning around June 1st but have a very short season. Here in Sedona, Iris are seen everywhere in all colors and varieties. 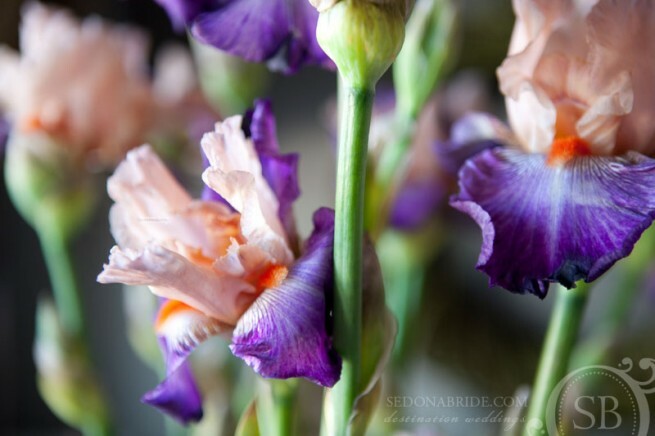 When possible, Iris are great flowers to use for Sedona weddings. From a design perspective, Bearded Iris are tricky to work with. Because they are in constant transition, designers have to anticipate what stage they will be in for any particular use. It’s all about timing. Secondary buds, for example, would be completely waisted if the were to be deep in an arrangement where they could not open properly. It’s always best to keep the stems long and elegant allowing for every bloom to fully open. Many color schemes come straight from nature and can be quite unexpected. Like this image shows, who would think of using a color palette of deep purples to violet, with lavender, peachy pink and finally red orange accents? Gorgeous! Iris have particularly interesting color combinations and can inspire endless color schemes that translate well for Sedona weddings. About Sedona Wedding Studio ~ We are an online directory of experienced local Sedona Wedding professionals who live and work in and around Sedona and northern Arizona. Our goal is to encourage couples planning a destination wedding in Sedona to reach out to quality and experienced local wedding professionals first.